Our bogie carriage dates back to 1887. It was originally built by the Metropolitan Railway Carriage and Wagon Company for the Cavan and Leitrim Railway. It worked on that companies lines from Ballinamore to Belturbet, Arigna and Dromod until closure of the system under CIE in 1959. As built it carried a clerestory type body and an enclosed interior something like this image of the interior of C&L carriage No.5 at the UF&TM at Cultra Northern Ireland. In 1953 in an effort to modernise and reduce maintenance costs the carriage lost its original body in favour of a bus type body similar to this carriage at Dromod, which it retained until withdrawal in 1959. 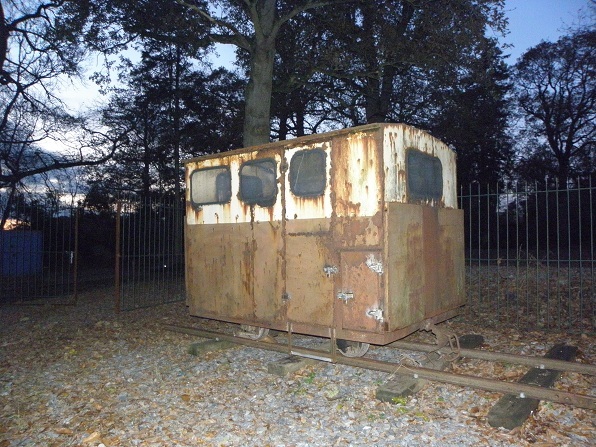 The carriage avoided the scrapman after being purchased by Bord na Mona and seen use with them on the Mountdillon System in Co. Longford and Roscommon until purchased by the Irish Steam Preservation Society in 1972. Once purchased it was found the body was not suitable for its new owners and the body was removed and chassis shortened with a new toastrack body built based on a similar vehicle used by Bord na Mona on the Clonsast system. The carriage entered service in its new guise at Stradbally in 1973 and remains in service to this day being the oldest passenger carrying vehicle on an Irish Railway in 2017 at a mere 130 years old! Our brake van has its origins in a flat wagon from the former railway at the British Aluminium plant at Lochaber near Fort William in Scotland. It was one of a fleet of 12 such wagons supplied by Bagnells of Stafford in 1929. After closure of the Lochaber Railway in the 1972 the wagons were left to rust away but several were sold to Lord O'Neill at Shanes Castle Co.Antrim. Some of the less fortunate wagons lay abandoned in original condition such as this wagon seen at Fort William. It is currently operational and has guards and propelling control equipment fitted for operating with both the Steam loco and also No.4 "Rusty". Lamp brackets are fitted on both ends of the van the one on the inner end was fitted for haulage via its rear coupler by"Nippy" which happened in the 1990s during a spell when both No.2 and "Rusty" were both out of service. This Hudson Railbogie was bought from Bord na Mona in 2012 having been purchased from the Bord na Mona Derrygreenagh System. It was originally a bogie from a Sod Turf Wagon. Many Sod Turf Wagons were withdrawn after the closure of most of the locations processing turf by 1991. 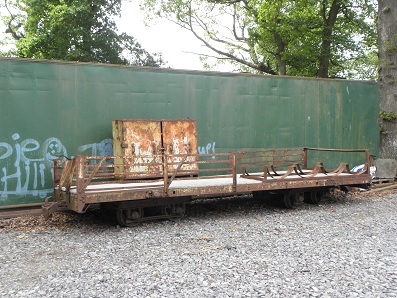 A number of bogies like this in good condition were reused as Railtrucks with a fork mounted on the bogie centre pin allowing two Railtrucks to carry up to 6 30ft panels of temporary track for laying out to working areas on the Bogs of the Midlands. With the decline of peat processing around the North of the Derrygreenagh System since the closure of Rhode Power Station in 2000 many wagons such as these were surplus to requirements and two came to Stradbally, No.82 pictured here and a second No.39 which has been stripped of parts and its coil springs and wheelsets to refurbish the Hudson flat wagon. This Hudson Wagon was bought from Bord na Mona in 2012 having been discovered by an Industrial Railway Society party from the UK on the Bord na Mona Derrygreenagh System. It was originally a Turf Wagon with high slatted sides and a tipping door on one end. These wagons were built new for the Generating Station at Portarlington but the arrival of the three steam Engines made these 4 wheel wagons inefficient compared to bogie wagons then on order. Nonetheless a trial was carried out and one of the Barclay Steam locos successfully hauled 43 of these wagons laden to the Generating Station. it is likely that during this period in the early 1950s that the wagon seen haulage by both our Steam loco No.2 and our Diesel loco No.4 "Rusty". Once the bogie wagons arrived these 4 wheelers were sent off to smaller railways for turf traffic to local tipheads for domestic fuel. One this traffic started to dwindle in the early 1990s many of these wagons were converted for service use for carrying oil barrels and tools out to worksites. These duties allowed such wagons to continue in existence until preservation beckoned at Stradbally in October 2012. In July 2013 a new steel floor was fitted along with drop down sides and a hinged tailboard for discharging ballast. The wagon operated with its new body for the first time transporting several tons of spoil. 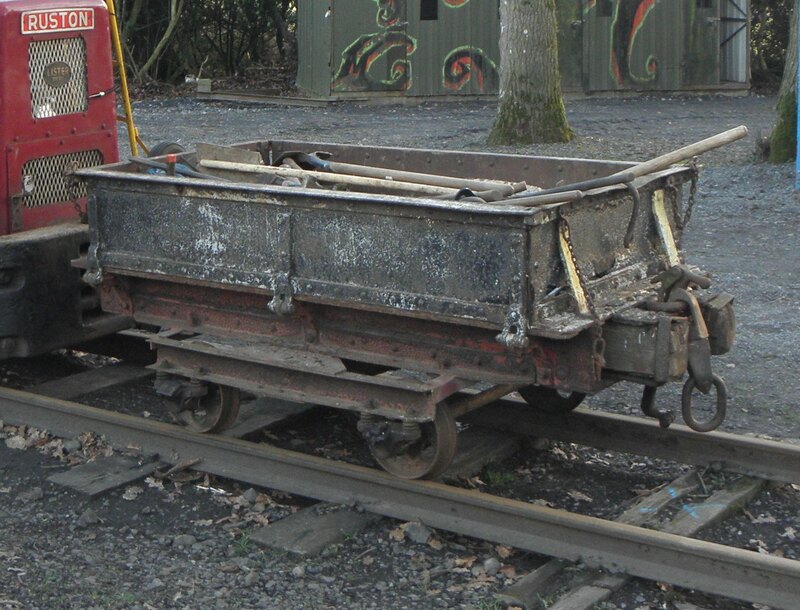 This wagon was discovered in a Bord na Mona yard at Rathdrum near Tullamore by one of our volunteers. It is believed to be have its origins in a Hudson V Skip wagon. Built in the 1950s it is believed to have seen use moving stone from a Quarry on the Bord na Mona Oweninny System near Bellacorrick Co.Mayo, it later moved to Coolnamona near Portlaoise where it was used for carrying rubbish around the main works site. At some stage after 1985 its body was removed and stanchions fitted to permit its new use for carrying plastic sheeting out to the bogs to cover the Piles of Peat awaiting transportation to Power stations. Since arriving at Stradbally the wagon has been repaired and restored and has taken over some of the work previously done by the Guinness Wagons. The low floor makes the wagon ideal for carrying sleepers which is the staple work nowadays for this remarkable survivor. 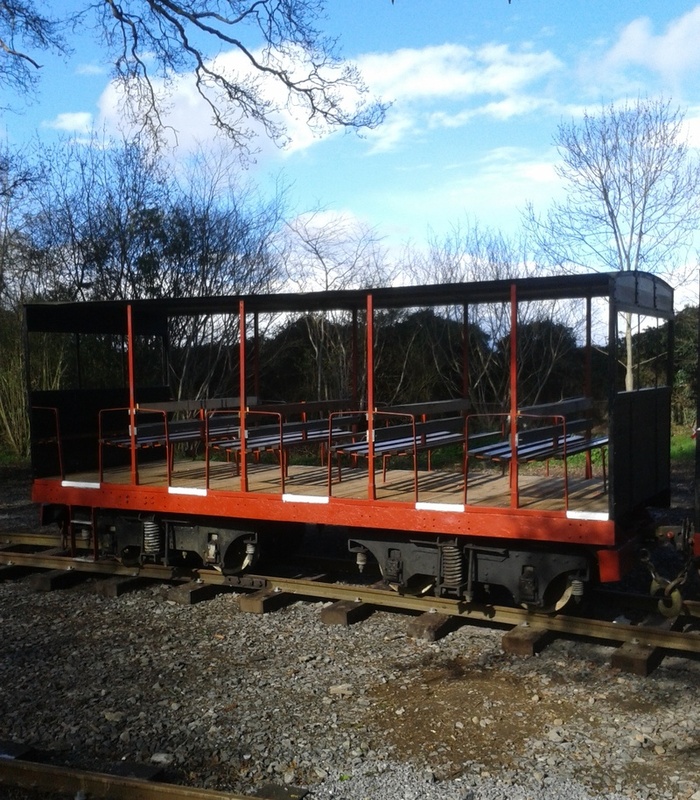 Thanks are due to Andrew Waldron of the Industrial Railway Society and Eamon Mulhall of Bord na Mona for help in purchasing the wagon from Bord na Mona. This wagon was used on the Derrygreenagh System of Bord na Mona. It was built for the high bunkers in the turf fired Power Stations of Allenwood and Portarlington. The lifting lugs to enable the wagon to be lifted off its bogies can still be seen over the centre of the bogie on the wagon side frame. The wagon was used in its later life at a service wagon used for maintaining bog machinery, the brackets on the right were used for holding transmission fluid and lubrication oil barrels. The press fitted on the left was used for holding parts and tools. The wagon was inspected by an ISPS team of volunteers and was found to be suitable for future permanent way use at Stradbally and was purchased from Bord na Mona with their kind assistance. It arrived at Stradbally in May 2011 and is currently stored. 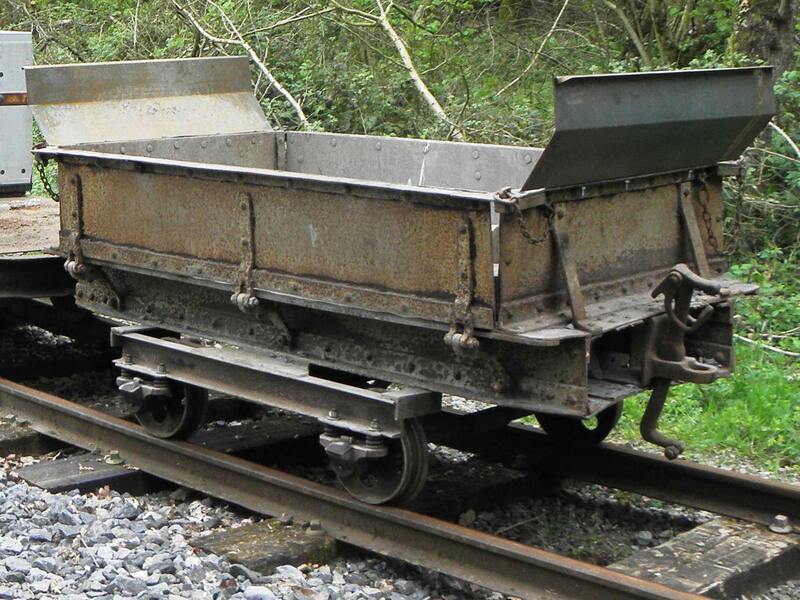 This Shift Wagon was used by Bord na Mona for many years at their Coolnamona Works in Co.Laois. It served as both a mobile canteen and a transport carriage to bring workers out to work sites hauled by a locomotive. The wagon fell out of use around 2000 as the volume of traffic at Coolnamona decreased, it was prepared for a return to service in 2009 but work was abandoned and a bogie vehicle was constructed to replace it. With the wagon rebuild abandoned it was surplus to the requirements of Bord na Mona and with assistance from Bord na Mona and Michael Stone of Barrow Nore & Suir Heritage Railway Group it moved to Stradbally in September 2010. Following research into the history of the vehicle an interesting fact has come to light, this wagon had been to Stradbally before in 1972 where it acted as one half of the passenger train in conjunction with another similar vehicle. The wagon was originally built around 1946 as a 4 wheel turf wagon and converted into a Transport Wagon for the official opening of Bord na Mona at Coolnamona in 1966. Following its visit to Stradbally in 1972 it returned to Coolnamona where it was improved with the addition of enclosed bodysides and a turf fired stove. It worked in this fashion until about 2000. Unfortunately the bodywork has suffered considerable corrosion over the years and quite deal of work would be needed to restore it to operational condition. It is expected that the body will be removed in 2016/7 and the wagon converted into a flat wagon. The origins of these wagons is not entirely clear, they date from around 1877 and were used on the internal railway at Guinness Brewery at St James Gate in Dublin. 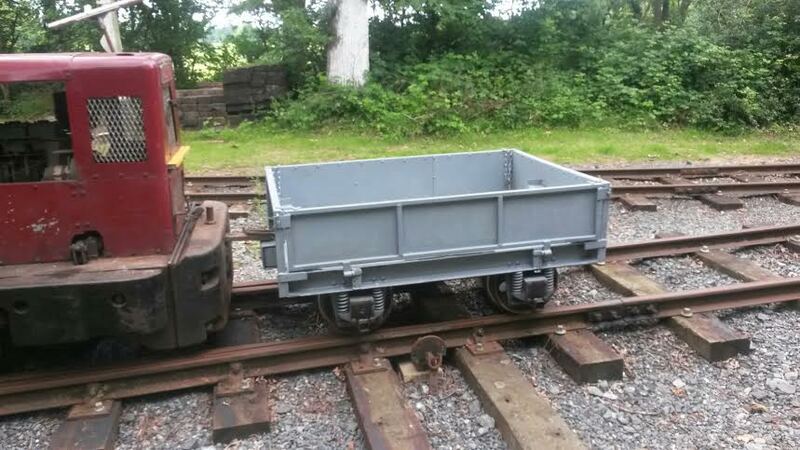 This is one of 4 Guinness Engineering wagons purchased in 1966 for the original 1ft 10 gauge line at Stradbally. After conversion of the line to 3ft two of the 4 wagons were converted to 3ft gauge by combining them with bogies from former turf wagons from the Irish Peat Development railway at Annaghmore Co.Armagh. The wagon has served the expansion of the railway which was completed in 1982. From 2002-2009 the wagon was confined to operating close to the shed as it carried most of the bodywork of the steam loco No.2 while its boiler work was ongoing. In recent times this wagon tended to be used for ballast and since withdrawal of the second former Guinness wagon it was relegated to carrying tools and equipment for track maintenance, it is now the last wagon from the former Guinness Railway at St James Gate Brewery in Dublin in operation anywhere in the World. By August 2013 it had been removed from active service having been replaced by a newer Bord na Mona Hudson built wagon. 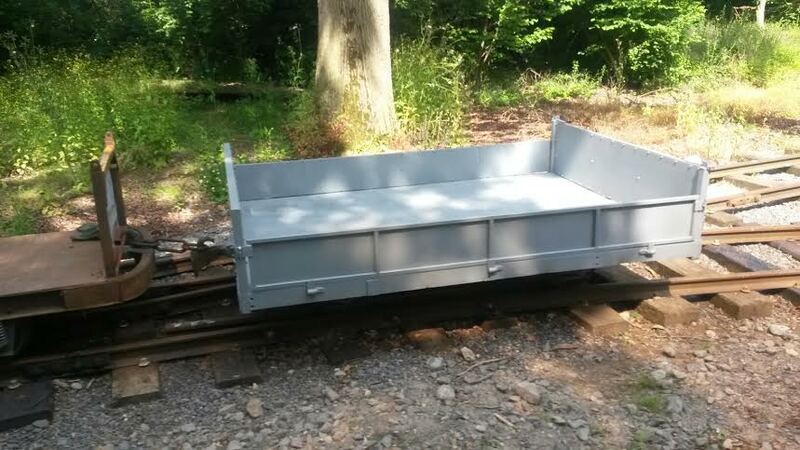 This wagon moved to a new home at the Cavan and Leitrim Railway at Dromod in 2015. The second Guinness wagon has the same origins in the St James Gate Brewery in Dublin. It is thought to have been built in 1877. The wagon was re-gauged in early 1970s using a bogie from a former Irish Peat Development Company turf wagon. The wagon was repainted into Stradbally black and royal maroon livery although it is in need of another coat at present! This wagon has been the principal engineering wagon for ballast and sleeper transportuntil the arrival of the Hudson Sleeper wagon in 2011, since then carrying tools and track bending and jacking equipment have been the main duties. This wagon has been withdrawn from active service in early 2013 due to deterioration on the framework on the running gear. 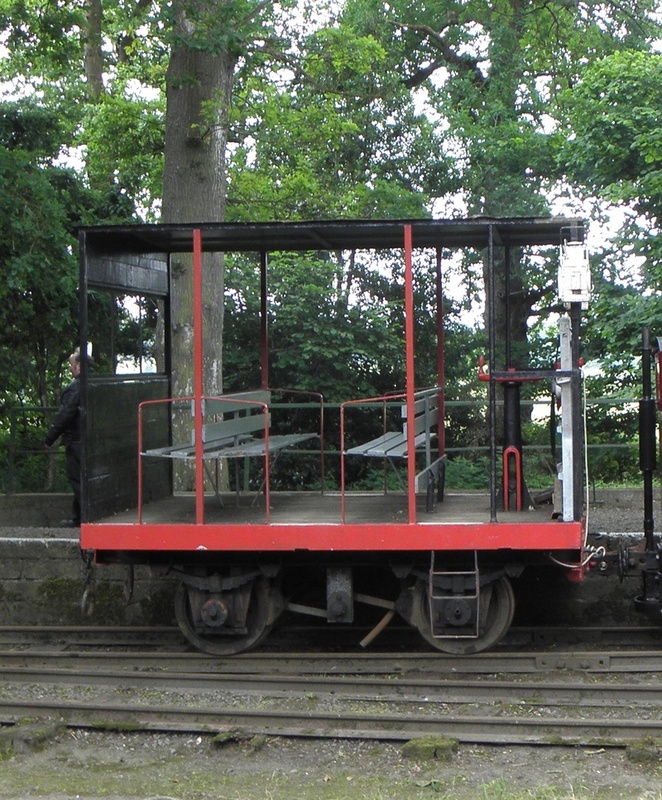 This wagon moved to the Cavan and Leitrim Railway at Dromod in 2015.